Browse: Home / Phishing catcher – Phishing catcher using Certstream. 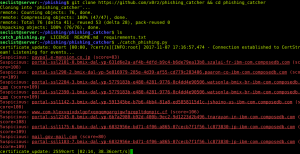 Phishing catcher is python scripting for Catching malicious phishing domain names using certstream https://certstream.calidog.io/ SSL certificates live stream. One of the problems is that there is currently no easy or effective way to audit or monitor SSL certificates in real time, so when these missteps happen (malicious or otherwise), the suspect certificates aren’t usually detected and revoked for weeks or even months. What’s more, these types of SSL missteps are occurring with increasing frequency. Over the past few years there have been numerous instances of misissued certificates being used to spoof legitimate sites, and, in some case, install malicious software or spy on unsuspecting users. ← clsniffer – Dynamically change firewall.